An absolute best seller. With High Back support, two cushion comfort and reclinability the Oakridge Recliner chair really is a winner. Team it with the recliner footstool for optimum comfort. 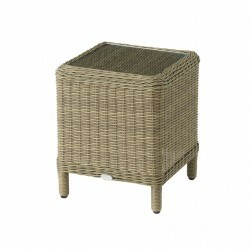 Bramblecrest Oakridge furniture features an oatmeal Coloured 5mm half moon weave that is lightly brushed to give the authentic look and feel of natural wicker. The Season-Proof Cushions are produced using the latest Dry-Tech fibre and can remain outside all season. They have removable covers that are machine washable at 30 degrees. View the entire Bramblecrest Oakridge range.